The delightfully located Schönbergalm Nature Park at the Dachstein Krippenstein middle station is the ideal place for viewing, admiring and relaxing. This small paradise at the end of section 1 is the starting point for visits to the Dachstein Giant Ice Cave and the Mammut Cave and offers plenty of room for letting off steam or relaxation! Here there is a cave museum to explore, kids can set off on a voyage of discovery through the Mutmam cave or explore the labyrinth of caves from the viewpoint of a cave explorer at the Sauwetterstation cinema. Past the Almbodenkick mini football ground, it’s on via an experiences trail to the Bamhittl where you can enjoy views of the meadows. A climbing trail, information on the geology of the region and plenty of opportunities for rest and relaxation complete the range of offers right by the cable car middle station. 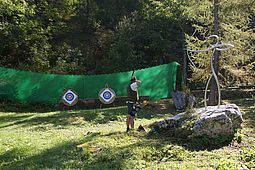 The Nature Park is located at the middle station Schönbergalm where you can relax (restaurant, relax zone) and discover (museum, Almbodenkick, ...) and is the access point to the guided cave tours and training ground for archery. Here at the middle station, you can find the information counter / cave ticket desk where you can register for the cave tours in the Dachstein Ice Cave and Mammut Cave. Just get the cave tour number at the cave ticket counter and then enjoy the time at the idyllic Schönbergalm until the cave tour start! 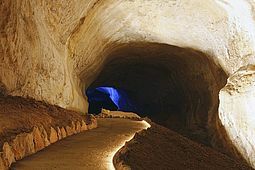 NOTE: registration is essential for the cave tours! A shop in the middle station Schönbergalm is on hand to provide you with little souvenirs, walking maps, rain protection and much more to ensure that nothing stands in the way of you enjoying the mountains!